Congrats to Adam Scott on another stunning victory at the 2016 WGC Cadillac Championship. Here's what's in Adam's winning bag. 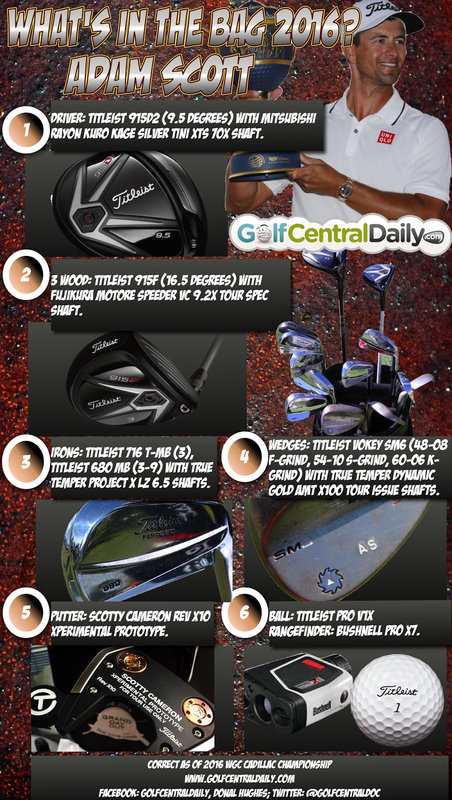 What's In The Bag 2016 Adam Scott. What's In The Bag 2016 Adam Scott. WITB correct as of WGC Cadillac Championship. Driver: Titleist 915D2 (9.5 degrees) with Mitsubishi Rayon Kuro Kage Silver TiNi XTS 70X shaft. 3 Wood: Titleist 915F (16.5 degrees) with Fujikura Motore Speeder VC 9.2X Tour Spec shaft. Irons: Titleist 716 T-MB (3), Titleist 680 MB (3-9) with True Temper Project X LZ 6.5 shafts. Wedges: Titleist Vokey SM6 (48-08 F-Grind, 54-10 S-Grind, 60-06 K-Grind) with True Temper Dynamic Gold AMT X100 Tour Issue shafts. Check out all Adam's clubs new and pre-owned on Golfbidder.